In September of 2010, construction on the footings of the new Cheetah Hunt Coaster at Busch Gardens in Tampa Bay, Florida was in danger of falling behind schedule. 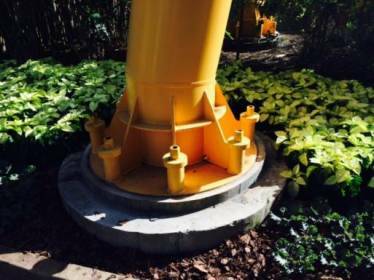 Because of our reputation for fast turn around and quality product, Portland Bolt was selected to supply the custom anchor bolts required for the coaster’s footings. In just over one week, Portland Bolt was able to manufacture over 300 large diameter, custom F1554 Grade 105 anchor rods of differing lengths and ship them via overnight air to Tampa, Florida. Our ability to respond to the customer’s time critical requirements helped keep the project on schedule. Set to open Spring 2011, the Cheetah Hunt coaster will be the newest attraction at Busch Gardens Tampa. It will be a Linear Synchronous Motor (LSM) Launch Coaster that uses the force of repelling magnets to launch riders from 0 to 60 mph in a matter of seconds. The coaster will accelerate riders to 60 mph and up into the ride’s signature tower element that will climb more than 10 stories above the African landscape theme before plunging them 130 feet into a subterranean trench. The new ride will set a new length record for Busch Gardens’ roller coasters at 4,429 feet of track.